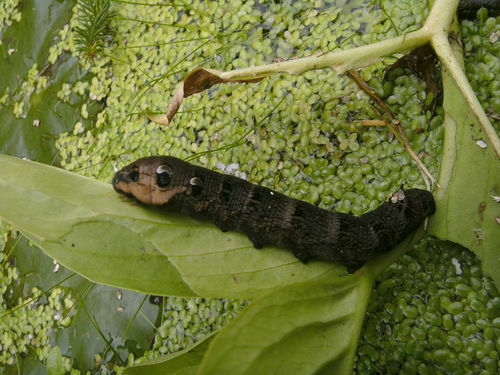 In Worcestershire Record Number 27 (November 2009) Wendy Johnson reported that an Elephant Hawkmoth Larva Deilephila elpenor was feeding on Bogbean Menyanthes trifoliata in her garden pond. I read this at the time, and probably thought it odd and unusual, but then promptly forgot all about it. 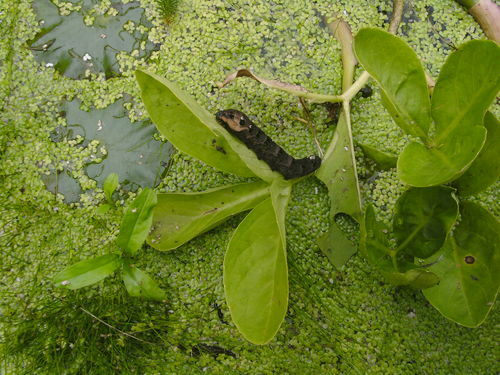 I was therefore surprised when my wife called me out to the garden to look at a large caterpillar that was feeding on the Bogbean in the pond. It was clearly a late stage larva of Elephant Hawkmoth, so I took a couple of photographs, and showed them to a few naturalist colleagues. It was only then that I was reminded of the 2009 article. The earlier article showed that my experience was not unique, but still left many questions unanswered. None of my books suggested Menyanthes as a food plant and I had never found the larva in wet vegetation. We looked to see what the caterpillar did for several days, but every morning and evening it was sitting in the same spot on the same leaf although some other leaves seemed to have more eaten overnight. And where and how would it pupate. Then one morning it had disappeared. I asked Harry Green for advice, and he pointed me to Sphingidae of the Western Palaeartic. This website (http://tpittaway.tripod.com/sphinx/d_elp.htm) was very useful and answered some of my questions. Menyanthes does get a mention as a “Minor Host-plant”. The first habitat mentioned under Adult Biology is “Frequents the flood-plains of streams and rivers”, so maybe I just haven’t looked hard enough for the larva in wet vegetation. The pupation question is more difficult. The website says “Pupation takes place very close to the host-plant in a strongish mesh cocoon amongst debris on the ground”, although there is some suggestion that aspects of pupal behaviour “may be an adaptation to avoid drowning during flooding of the habitat” I find it hard to believe that our larva could have climbed out of the pond, so I am unsure what did happen to it. Pittaway, A.R. 1993. The hawkmoths of the western Palaearctic. Harley Books, Colchester. Sphingidae of the Western Palaeartic. Website http://tpittaway.tripod.com/sphinx/d_elp.htm.